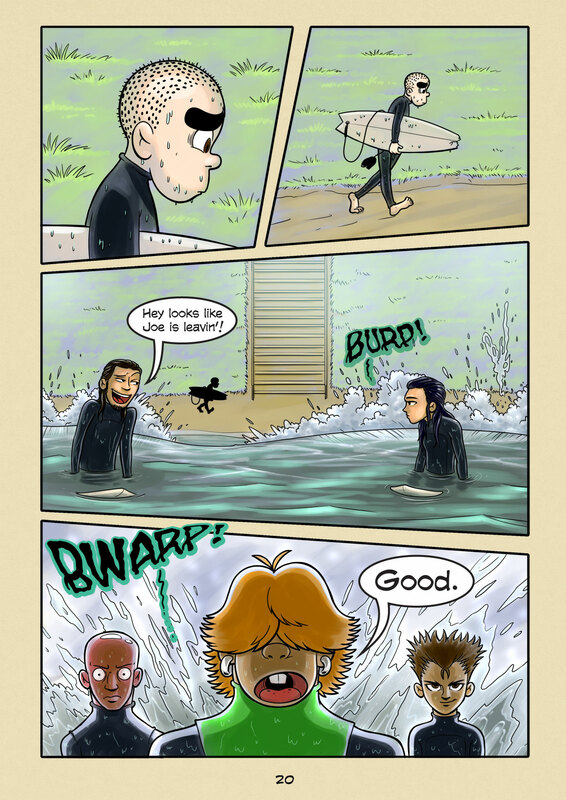 When Waves Burp (#020) | Web comic "Surfer Joe"
Ever heard a wave burp? You know when everything at your local beach break is closing out on the inside. Big, thick nasty lips crashing in shallow water, kicking up sand and spewing whitewater in unnatural ways. It’s days like this when the ocean is here to eat surfers whole, and even small waves can be sketchy. When they blow out like that sometimes I swear I can hear them burp with delight. It’s no secret that learning to surf is hard. The ocean is gonna do whatever it wants to do, and your job as a surfer to adapt to it. If you can’t you are in for some rough times. Part of that is knowing your comfort zone and paying attention to the forecast. As human beings our time is limited. We have responsibilities that pull us in all different directions, and our schedules get filled up quickly. Finding time to surf can be hard enough, but find time when the conditions are ideal for our skill level is even harder. Just to get decent enough to where you can enjoy the sport takes a sizable commitment, and this is where most people who try it fall short and end up giving up. The ocean will chew you up and spit you out if you don’t take it seriously, and I think that’s why locals don’t appreciate kooks who are there for the wrong reasons. They become hazards in the water, and increase the chances of people getting hurt. It raises tension in the lineup. Every surfer knows the risks and accepts the responsibility, and sitting next to someone who hasn’t is down right scary. But how does one learn, without putting themselves up as a feast for the waves?